WMV, short for Windows Media Video, is developed by Microsoft. WMV was originally designed for Internet streaming applications. Windows Media Video (WMV) is the most recognized video format within the WMV family. Unfortunately it is not one of the standard HTML5 native video formats. New HTML5 web browser compatibility is really a challenge for those who want to upload the WMV to the web to share with their friend. On a previous online tutorial, we talked about How to Convert WMV to MP4? In this tutorial we will introduce a solution, showing you how to convert WMV to OGG/OGV format which is a compact and most important of all it is HTML5 compatible video. Before we start the WMV to Ogg/Ogv conversion, let’s take a look at the Ogg/Ogv video, as many of us may not be quite familiar with it. Ogg is a free, open container format maintained by the Xiph.Org Foundation. Before 2007, the .ogg filename extension was used for all files whose content used the Ogg container format. After 2007, a new set of file extensions and media types were created by the organization to refer to different types of content, for instance, .oga for audio only files, .ogv for video with or without sound (including Theora), and .ogx for multiplexed Ogg. That could be confusing for common users though. Today, video in Ogg is found with the .ogv file extension, which is formally specified and officially supported. Ready to convert WMV to Ogg/Ogv now? Let’s follow bellow WMV to Ogg/Ogv converting steps. It would be easy and fun, takes just a few clicks but comes out with great video quality. All in all, the Ogg/Ogv is supported by HTML5 web browsers. We know what HTML5 is a hot and emerging technology nowadays. HTML5 Video Player is the only WMV to Ogg/Ogv conversion tool you will need to use in this converting task. It is the HTML5 video converter that actually works. It provides the all cross platform solutions, works on both Mac and Windows. You can Download WMV to Ogg/Ogv converter – HTML5 Video Player here. The video converter is easy to operate. It does a beautiful job and most of the operation can be done by drag-n-drop. You can drag and drop your WMV video to the WMV to Ogg/Ogv converting software to load WMV files for conversion. Alternatively you can click ‘Edit’ menu, then select ‘Add Videos’ to browse through your media folder on your computer hard disk. Note: No need to select Ogg/Ogv as output video format. After the conversion, your WMV videos will be converted into three different copies in mp4, ogv and Ogg/Ogv formats separately. Why is that? You can check out this tutorial：How to Maximize HMTL5 video Compatibility? This is the last steps to finish the WMV to Ogg/Ogv conversion. Before you hit the ‘Publish’ tab to finalize the WMV to Ogg/Ogv converting, you can click the ‘Preview’ button to preview your WMV in Ogg/Ogv format. Please note the preview function will only convert a very small part of your source WMV into Ogg/Ogv format. It is because we realized that many users might need to change the video settings many times before they find the satisfied videos and settings. So once you are satisfied with the previewed video, go to click ‘Publish’ button to convert WMV to Ogg/Ogv. Now all you know is that the video converter is good for converting WMV videos to the Ogg/Ogv format that you want. That’s already cool. However you may like to upload the converted video clips to your websites or bloggers as well, which is also very interesting. And we promise it is not difficult at all. By embedding Ogg/Ogv into websites, you can share them with others around the world. As we mentioned before, the video conversion tool outputs different HTML5 video formats, that’s to say your online video will have the maximum browser and device support, even on mobile phones and portable devices. 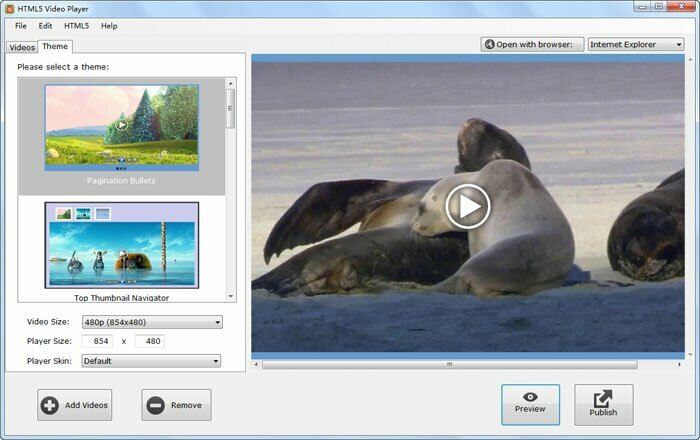 Now you know how to convert WMV to Ogg/Ogv and upload them onto websites!